Megan Reith is a Chemical Engineer for PepsiCo Global Research & Development and currently works on innovations for brands such as Aquafina®, Mountain Dew®, and Pepsi®. Megan visited the high school this fall and was excited to share her professional development journey of becoming an engineer with our students: from selecting the right major, discovering internship opportunities at college, and working in the industry! 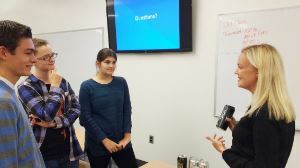 She shared with students some of the many exciting opportunities in the engineering field, drawing from her own personal experiences working in both manufacturing and research settings. In addition, she highlighted the science, challenges, and creativity that go into making some of the world's most iconic beverages. Megan is a Mt. Lebanon High School graduate (2009), and is passionate about helping students make the transition from high school to STEM fields in college and beyond.